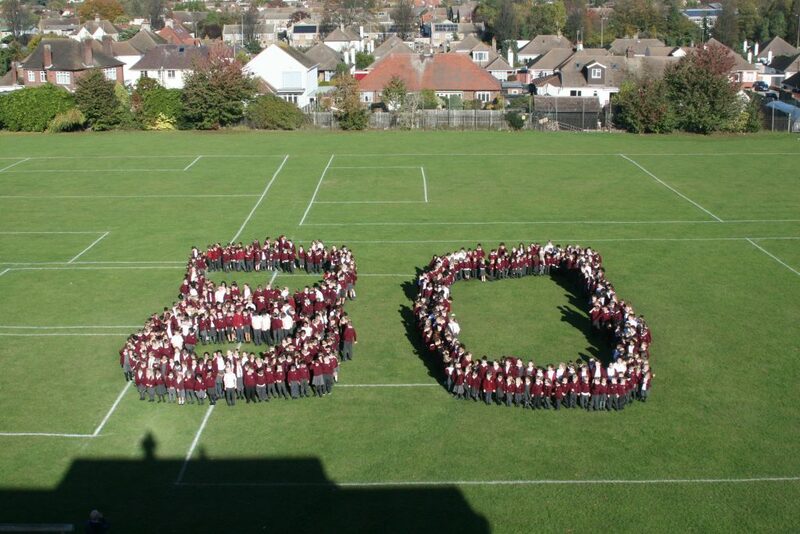 The end of the week saw us finish our 80th anniversary celebrations with the events culminating in the children creating a massive ’80’ on the school field! The teachers keeping their fingers, and everything else, crossed worked wonders as the weather stayed dry so there were no soggy children! Mr Smith arranged a series of markers on the grass and the teachers and teaching assistants assisted the children, a class at a time, to stand in the right places to form the digits. The Year Sixes took the lead in the centre of the numbers and each year group joined them in turn until the Foundation Stage formed the outside. Meanwhile Mr B and Mr Gheorge scaled the roof in order to get in the right position to take the photo, communicating with Mr Geach down below to ensure that nobody moved out of place! After a while the photo was taken, continuing a tradition dating back thirty years when the children of the time at Earls Hall first formed a ’50’ on the field. Well done to everybody involved for marking the schools anniversary in such a great way! Throughout the day the children were visited by more former children and staff. Today saw us visited by Mrs Batchelor who taught at the school for a number of years, leaving eight years ago. We were also joined by Mrs Giles, nee White, who taught at the school in the late 1970’s before leaving at the beginning of the 80’s. Both teachers were given tours of the school by Mr B and Mr Geach and loved meeting up with familiar faces and visiting their old classrooms. Thanks to everyone who came along to join in with the celebrations. Our weekly ‘Celebration Assemblies’ saw the children present the weeks ‘Earls Hall Stars’ certificates as well as rewards for their times tables and reading at home. Warwick earned the most behaviour points throughout the week but not quite enough to overtake Arundel who remained at the top of the leaderboard! In the afternoon the children in Hawks enjoyed a fun French session which saw them singing in the language and, when Mr B visited the class, an impromptu dance session also took place with great hilarity! After school the downstairs hall hosted the first of our ‘Sci-Fi’ clubs where the children made spaceships and aliens out of Lego and sticklebricks. They made their own alien puppets and were treated to shows such as ‘E.T’. Meanwhile, down in Rabbits, another session of the ‘Clay Cottage Club’ took place which saw the children making wonderful pots! ← Trips Down Memory Lane!